Wilkinson, Bruce W.. "General Agreement on Tariffs and Trade (GATT)". The Canadian Encyclopedia, 22 September 2017, Historica Canada. https://www.thecanadianencyclopedia.ca/en/article/general-agreement-on-tariffs-and-trade. Accessed 21 April 2019. The General Agreement on Tariffs and Trade (GATT) was an international trade agreement signed by 23 nations, including Canada, in 1947. GATT came into effect on 1 January 1948 and was refined over eight rounds of negotiations, leading to the creation of the World Trade Organization (WTO), which replaced GATT in 1995. GATT was focused on trade in goods and aimed to liberalize trade by reducing tariffs and removing quotas among member countries. Each member of GATT was expected to open its markets equally to other member nations, removing trade discrimination. The agreements negotiated through GATT reduced average tariffs on industrial goods from 40 per cent (1947) to less than 5 per cent (1993). It was an early step towards economic globalization. GATT was established in 1948 to regulate world trade. It was created as a means to boost economic recovery after the Second World War by reducing or eliminating trade tariffs, quotas and subsidies. During the Great Depression, a breakdown of international relations and an increase in trade regulation made poor economic conditions worse and contributed to the outbreak of the Second World War. After the war, the Allies believed that a multilateral framework for world trade would loosen the protectionist policies that defined the 1930s and create an economic interdependency that would encourage partnership and reduce the risk of conflict. The idea was to establish a code of conduct that would progressively liberalize (remove or loosen restrictions on) international trade. Within this code of conduct, consultation on trade issues among member nations could take place and be resolved, and data on world trade characteristics and trends could be collected and shared. Established over a year before the North Atlantic Treaty Organization (NATO), a Western military alliance, GATT played an important role in the Cold War, which began shortly after the Second World War. It helped the US-led capitalist West spread its influence by liberalizing trade through multilateral agreements. The West, with which Canada was aligned, gained more economic allies through these agreements, which strengthened its global influence in the face of the communist Eastern bloc led by the Soviet Union. After the Cold War, with the collapse of the Soviet Union in 1991, GATT transitioned into a truly global organization — the WTO — and admitted former communist bloc countries, such as Czech Republic, Poland and Romania. GATT was first discussed at the United Nations Conference on Trade and Employment in Havana, Cuba (1947), where the idea of creating the International Trade Organization (ITO) was proposed (see United Nations). It was hoped that ITO would complement the World Bank and International Monetary Fund (IMF) in fostering international economic cooperation. While more than 50 nations were negotiating ITO and organizing its founding charter, preparatory sessions were held regarding GATT. After several sessions, Canada and 22 other nations signed GATT on 30 October 1947 in Geneva, Switzerland. The agreement came into effect on 1 January 1948. It was initially seen as a provisional agreement that would be superseded by ITO. After the United States backed away from ITO in 1950, the focus shifted to GATT (see also Globalization).While regular trade negotiations were conducted and refined among member states on a regular basis, eight multilateral trade conferences (called rounds) were held between 1947 and 1994 (see International Trade). GATT was established at the first round in 1947, with subsequent rounds hosted in Annecy, France (1949), and Torquay, England (1951). All other rounds were held in Geneva in 1956, 1960–62 (Dillon Round), 1964–67 (Kennedy Round), 1973–79 (Tokyo Round) and 1986–94 (Uruguay Round). To prepare for GATT, the 23 signing nations carried out negotiations among themselves to reduce some tariffs and other trade barriers. Canada negotiated bilaterally with seven of the countries. Its discussions with the United States were the most extensive of any that took place at that time. Canada had negotiated trade agreements with the US in 1935 and 1938, but once both nations signed GATT, it became the basic agreement governing trade relations between them, superseding the 1938 agreement (see Canada-US Economic Relations). GATT rules required that any member country give all members the same privileges regarding tariffs and other commercial policy measures that it gives to the most favoured nation (MFN) with which it negotiates. This is known as the MFN principle, and it was established to remove trade discrimination. 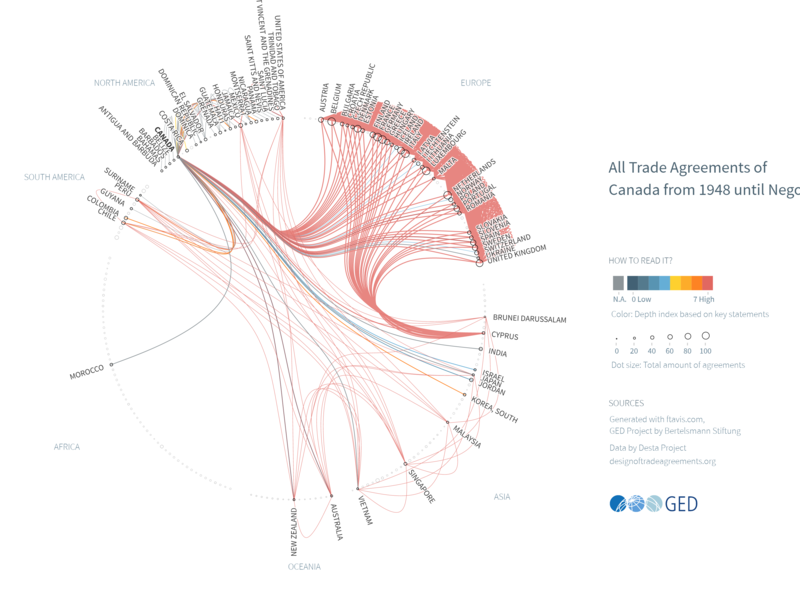 Canada was part of several multilateral trading groups that operated in concert with GATT, including the Organisation for Economic Co-operation and Development (OECD), the Quadrilateral Group and the Cairns Group of Fair Trading Nations. Membership in these groups allowed Canada to influence the direction of trade negotiations. The most influential group was the informal Quadrilateral Group, or the “Quad” as it was called, which surfaced early on in GATT’s history. The group included Canada, Japan, the US and the European Union — the world’s largest trade entities at the time. The Quad introduced most of GATT’s reciprocal tariff cuts, which lowered rates among all GATT countries in accordance with the MFN principle. The Quad became a more formal alliance at the 1981 G7 summit in Montebello, Québec. It was most influential during the Uruguay Round, when it prioritized agricultural negotiations and pushed for the creation of the WTO. Did Canada Receive Special Benefits? Some exceptions to the MFN principle were permitted, and Canada was a beneficiary of several of them. The US received a waiver from the MFN rules to enter the Canada-US Automotive Products Agreement (Auto Pact) in 1965. Canada didn’t need to get a waiver because it allowed firms from every country to participate, provided that they adhered to the rules. Like other developed countries, Canada also received waivers to grant tariff preferences to developing countries on a range of products under the Generalized System of Preferences. Canada was also a party to the Multifibre Arrangement (MFA), which allowed developed countries to impose quantitative import restrictions on textile imports from developing countries (the agreement was replaced by the WTO Agreement on Textiles and Clothing in 1995). Finally, free trade arrangements among countries were allowed under GATT, opening the door to the Canada-US Free Trade Agreement in 1989 and the North American Free Trade Agreement (NAFTA) in 1994, among others. Quantitative limits on imports and export subsidies were generally prohibited by GATT, but exceptions were permitted under certain circumstances. The two most important exceptions for Canada were the MFA and arrangements for agricultural products. The latter products were excluded from the trade liberalization framework of GATT, primarily due to US insistence. Canada and other major agricultural exporters vigorously objected (see Agriculture and Food). Canada also objected to the special waiver that the US received in 1955 to enable it to restrict imports of dairy products, even though it had no domestic production controls. Subsequently, after much controversy, Germany and Switzerland got other waivers to restrict agricultural imports. Canada, too, developed its own share of restrictions on imports of grains and dairy and poultry products, as well as export subsidies of some dairy products and eggs to dispose of surpluses. As a result, early exclusions and waivers from GATT produced a maze of restrictions on agricultural imports and export subsidies that have plagued world production and trade in these product lines ever since (see Protectionism). GATT also condemned the practice of dumping (selling products abroad for less than they are sold domestically). Anti-dumping duties could be applied to countries that engaged in these practices if material injury to domestic industry occurred or was threatened or if a domestic industry could not be established because of them. The most important round of GATT negotiations was the Uruguay Round, which commenced in September 1986. It was concluded on 15 April 1994 after nearly eight years of negotiations and came into effect on 1 January 1995. The resulting comprehensive document included both major revisions to GATT as it existed after the previous seven rounds of negotiations and introduced a wide range of other agreements on two types of items: (1) matters not previously covered by regular GATT rules, such as trade-related investment measures, trade in services, intellectual property rights and agriculture, textiles and clothing; and, (2) issues addressed in an incomplete fashion in earlier negotiations, such as rules of origin, dumping, subsidies, safeguards and dispute settlement procedures. By the end of the Uruguay Round, 128 nations were part of GATT. The agreement struck at the end of the Uruguay Round also established the World Trade Organization (WTO) as an administrative institution replacing or subsuming GATT and encompassing all of the agreements and arrangements concluded in the Uruguay Round. While GATT was formally concluded at the end of the Uruguay Round on 15 April 1994, with the WTO taking effect on 1 January 1995, GATT remained the WTO’s umbrella treaty on trade in goods. Those nations wishing to be members of the WTO must first complete negotiations to become contracting members to GATT. As of July 2016, 164 countries were members of the WTO and 21 were observer governments (in the process of joining).